Changing gears from producing art to matting and framing art for exhibitions is always a bit of a wrench, I find. I don't know if others find it to be so. First of all, of course, it depends on what the exhibition is to be about, and where the show is to be held. An exhibition in a museum is different from one in a gallery where your art is for sale, and the choice of artwork to exhibit will correspondingly be different. Not of less quality, nonetheless. Any professional artist will always try to put the best work out for exhibition, no matter where. However, deciding on what the "best work" is can be an interesting exercice. I think any artist is always excited about the latest work done, and hopes and believes that it is better than previous work. Nonetheless, I have privately decided that whenever possible, it is good to put the art just completed aside for a while, so that I can then come back to it with a fresh eye. Only then can I have any distance and can better evaluate its merits and/or defects. I sometimes feel a little like the meandering salt water rivers entering the coastal Georgia marshes, such as I painted once. I am in the throes of trying to do just such an "agonising reappraisal" of work I had put away in a drawer, all carefully stored in mylar envelopes for the metalpoints and acid-free tissue leaving for the watercolours. First of all, I needed to sort through to try to make a coherent ensemble for a solo exhibition I am holding in January-February at the new gallery for Glynn Visual Arts on St. Simons Island, Georgia. Having selected out some art, then comes the more critical, eagle-eyed time. And that is the hard part! Having winnowed again, the resultant selection has to be matched up with types of mats - 4 ply or 8 ply museum mats. Next come their shades of white and cream (I tend to be super conservative in mat colours, trying to let the artwork speak for itself). Then what type of frame, what colour of moulding? So many decisions. And all part of the evaluation process because until the artwork on paper is matted, glazed and framed, you really do not know how it will finally look. So I scratch my head a lot, turn the artwork upside down, walk away from it, come close to it. I play light on it (especially for metalpoint drawings because the metals shimmer when you catch them in the correct light and really come alive). I fiddle with mats, mouldings, skin my fingers screwing and unscrewing moulding pieces – such fun! At the end of this whole evaluation process, which I suspect is familiar, in some form or another, to every artist, one just hopes that the result is an interesting, uplifting ensemble of art that appeals to the public. Stay tuned for January's news! Now that some time has elapsed since I finished my residency at DRAWinternational in France, I find I am still thinking about how to change gears. I went there on the premise that I wanted to explore the option of working on a larger scale in metalpoint, especially metalpoint on a black ground. Setting out on a new path in art-making always takes time for one to readjust, I know. It has happened to me before, but this time, other issues in life have complicated the "digestion period". You have to filter all the advice, new thoughts and suggestions, new concepts, and try to decide which road to take and how. This was one route, one way of changing gears, using graphite instead of metalpoint. This was another experiment in graphite. Eventually, I wanted to return to metalpoint, so I started trying to work larger and adjust - at least a little. I am still going back and forth in my mind about the direction I want now to follow, but I know that the residency was good for me, jolting me out of ruts. I am at the stage where I can look back on the work I did in France and join philosopher R. G. Collingwood as he talked of his own artistic upbringing. He said, "I learned to think of a picture not as a finished product exposed for the benefit of virtuosi, but as a visible record of an attempt to solve a definite problem in painting, so far as the attempt has gone." For me, the operative words remain, "as far as the attempt has gone". Still more changes to come, I hope! Silverpoint, or metalpoint when one refers to all the metals potentially used to make marks, seems to be a drawing medium which elicits instant interest in everyone to whom one talks about it. It always surprises me how its mysterious attraction remains intact. I was recently reminded of this attraction when I mentioned to a Spanish friend that I draw in silver, and also gold, copper, etc. What had been interest in what I said became intense attention as I was carefully quizzed about just was this drawing medium. Telling the story of how the monks started using lead for their lines in handwritten manuscripts and outlines for illumination from possibly the 8th century onwards, as demonstrated by the Lindesfarne Gospels, brings home the antiquity of this medium. The fact that, later, all the great artists whose names everyone knows - Leonardo da Vinci, Raphael, Lorenzo di Credi, Albrecht Durer - all used metalpoint, especially silverpoint, elicits even more interest. Graphite's appearance helping to decrease the popularity and use of drawing in metal is another surprise. Most people have never even thought about the origins and history of the "lead pencils" they use so often. The virtual disappearance of metalpoint after Rembrandt's few silverpoint drawingsand Judith Leyster's botanical studies in silver are the next chapter in the story I find myself frequently telling about this medium. 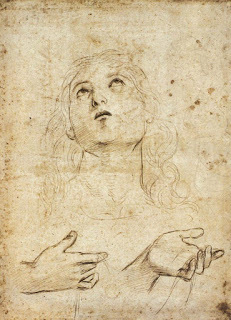 When Cennino Cennini's manuscript of the Il Libro dell' Arte was re-found in the early 19th century in an Italian archive, and people learned once more about silverpoint from Cennini talking of this medium and how to prepare all the materials to draw in metalpoint, there was a renewal of the medium. Now, in the early 21st century, after spluttering interest during the 20th century, there seems to be another renaissance in metalpoint, despite its relentless aspects of narrow value range, impossibility to erase marks and slow development of the work. With increased interest in drawing media in general, it is natural that metalpoint be one of the voices in the drawing chorus. There is a wonderful diversity in the work being done, from classical approaches to very experimental work. Realistic (helped by the very fine lines which characterise drawing with a metal stylus) approaches are complemented by strictly abstract work, but share the shimmering, discreetly elegant characteristics of these drawings. Metalpoint's allure, a medium that to me seems very much of our contemporary often sleek and understated approach to art and design, comes from its lustrous appearance and also, as I keep finding, its mystery of origins and history. I must admit, I thoroughly enjoy telling people about this drawing medium, and I suspect that my hundred or so fellow metalpoint artists also relish their role of ambassador for this special way of drawing. Thanks - once again! - to ArtDaily.org's listings, I happened on an up-coming Sotheby's sale of old Master Drawings from a private collection. I spent a fascinated hour on their site, going through the E-Catalogue of the drawings, some eighty of them, the ideal occupation for a dark, rainy day. It is always extremely interesting to view a collection of art formed by one person, particularly a person who has a trained eye and knowledge of the media involved. I quote from the news release about this collector (who apparently spent about 25 years assembling this collection). "In his very personal forward to the sale catalogue, the collector who assembled this remarkable group of drawings wrote that he embarked on collecting “with the bold aim of looking over the artist’s shoulder”. There can be no question that he succeeded in this aim. The light that these extremely varied studies shed on the artistic creative process is both intense and wide ranging: we see every moment in the artist’s thought process revealed and illuminated." There is a remarkable energy and life evident in the drawings this collector assembled. The artists are clearly in the throes of excitement and creativity. Famous names or not, it does not matter. The hallmarks of these drawings are immediacy, directness, sureness of touch and stroke. The collector does indeed describe well what he sought - and found - when he selected these works. Different media, different subject matter, some clearly well thought-out and planned, others on the spur of the moment, catching images almost on the fly... Some as aide-mémoires, others as exploration. In short, the collection came across to me as a most interesting selection of artists' emotions, desires, endeavours, aims... running a gamut of approaches and techniques. Little interesting items too, such as remarks about an exquisite study of a seated woman by Jean-Antoine Watteau. "It was executed in a combination of media that Watteau used only occasionally, but to striking effect: the majority of the figure is built up with a network of silvery strokes of graphite (a very rare medium in Old Master Drawings), (my emphasis) while the accents in the face and hands are in a more typical red chalk, an extremely effective juxtaposition that creates a lively yet utterly elegant figure." When you go back and try to find out about the use of graphite before the early 18th century, it is indeed hard, as a neophyte, to find allusions to many graphite drawings. Pure graphite, first mined in Borrowdale, England, in the 1500s, seems initially to have been used for under drawing in the 16th century. It was more forgiving than metalpoint, especially silverpoint, the draughtsman's favoured medium during Renaissance times in spite of silverpoint's linear qualities and permanence of mark. Graphite does not seem to have been used much for drawing until well into the 17th century. Artists tended to favour chalks, red and black, as well as charcoal for studies and finished drawings alike. (Interestingly, the Venetian artists continued to favour black chalk, whilst the perhaps more flamboyant Florentine and Roman artists preferred the harder red chalk with which they could show off their skills!) Graphite became widespread only in the 18th century, with the increasing difficulty of obtaining good-quality natural chalks and the simultaneous production of a fine range of graphite pencils after the invention of a graphite pencil in Nuremberg in 1662. Graphite drawings then become far more widespread: John Constable, Jongkind and later John Singer Sargent, for example, all used graphite in their work, particularly when working plein air. Ingres was famed for his use of hard graphite pencils when drawing his wonderful detailed portraits of people. By the turn of the 19th century, Cezanne and so many others commonly used pencils, as have we all done since in the art world - often to great effect. But back to the Sotheby E-Catalogue of the drawings that occasioned my little foray into the rarity of Old Master graphite drawings... (and by the way, the definition of Old Masters in Western art is work executed before 1800...), it is well worth going through this collection of images of drawings. It allows one to remember how interesting it can be when one sees an art collection formed by one person with the courage of his or her own convictions and erudition. Back in May when I was in Spain, I read with interest a long article in El Pais by Antonio Muñoz Molina on the artist Vija Celmins' exhibition then showing at New York's McKee Gallery. The descriptions told of how Celmins works, in her studio, in quiet solitude, communing with objects that she has brought into the studio from walks on the beach or Western deserts, from sidewalk or garage sales in New York or where ever. Her close inspection of the objects then is translated into minutely detailed, intimate paintings and drawings of surfaces, interiors, textures, patterns. Their abstraction and depth, both in tactile effect and message, seem to reach far beyond the mere frames. But always, these images apparently allow for imperfection, as it is first in nature and real life, but more so as she creates her art. The overall effect is powerful and compelling. Her work is very well considered, with awards and exhibitions in major institutions in this country. What interested me was the way she apparently deals with blacks - in paint but especially with graphite. When drawing with graphite, with all its permutations of hardness in the grades of Hs and soft Bs, a lot of skill is need to go on getting a more and more intense black. Unless you are careful, as with pastels, the paper surface gets to such a point of "saturation" that no more graphite will adhere. What is always fun, when looking at other people's art or reading about it, is to have a sudden idea about something interesting and new to try in one's own art. 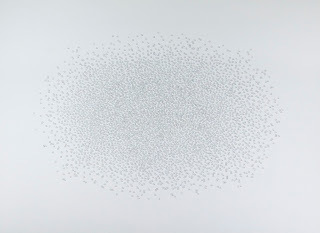 Thinking about Celmins' work brought back to mind a wonderful goldpoint/platinumpoint drawing I saw in the Telfair Museum of Art metalpoint exhibition, The Luster of Silver, in which I was involved in 2006. Dennis Martin, now sadly deceased, had done the most sensitive and beautiful portrait of his wife. He then surrounded this delicate, almost ethereal three-quarters-size portrait with deep, dark, lustrous graphite. 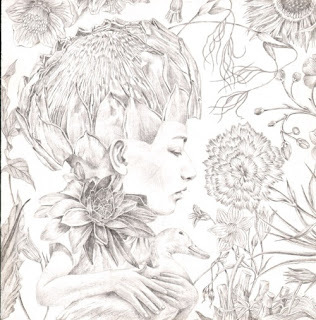 The contrast with the goldpoint drawing was dramatic and most effective. All these thoughts about artists' skills with graphite are tempting me. Now if the temperatures outside would just diminish a little, I could go off and start doing some drawing plein air! I wrote yesterday of my magical day drawing, with the added incentive of Sketchcrawl, truly a worldwide day of drawing. Each of us, in our own environment of choice, records and celebrates different drawing media. I was mainly using graphite. These were some of the small drawings I did. The small drawings were all done along a wonderful saltwatercreek near my home. The marshes are wide flung to islands, and the high ground is fringed with majestic old trees that have seen much history. Today was one of those gifts that nature bestows on one a few times each summer along the coast, when the humidity drops, the skies are clear and a gentle breeze makes the world joyously sparkling. It was the perfect day to be out drawing along the marshes, a welcome respite from other activities and concerns. The additional incentive was that it was a day designated for drawing by being part of the international Sketchcrawl group. It was a day to experiment too, with a slightly different format of graphite drawing, with prepared grounds in different subtle colours. I had seen artist George Sorrels' wonderful Arches drawing book in which he had prepared varying sizes of small squares and rectangles in subtle colour, page by pages. Then, according to the subject matter he found, he would select a prepared area and do a graphite drawing of exquisite beauty and sensitivity. So I prepared paper in a number of colours, and sallied forth. It was enormous fun to be drawing and experimenting, but more than the fun, there were so many gifts of the moment. The salt water marshes, emerald scintillating to golden, were generous with their ever-changing light. The tide flowed full and then softly ebbed, transforming the whole landscape, with the water surface rippled in a million patterns of light from the on-shore breeze. Osprey keened and sailed above. Herons stalked and drowsed, wood storks dangled their long legs just above the spartina grass as they flapped along to the next hunting ground and gulls dipped into the water and swirled back around to dip again. Marsh wrens chattered endlessly from their hidden perches. Schools of fish made their distinctive whoosh of water parting as they leapt in unison to escape a hidden peril. Time lost any meaning. I don't know if these gifts of beauty, music and peace show up in the art I did in any way, but as artist Phyllis Purvis-Smith remarked in a March 2009 article in American Artist, "experiencing nature for the artist is also important". I know that after the time spent drawing, I felt utterly restored by the generosity of the day.